Lynbrook High student May ``MayC'' Huang came home from the Junior Olympics held in Miami with a pair of medals. Huang, 14, won a silver medal in the 3,000 meters with a time of 10 minutes, 37 seconds, and took a bronze in the 1,500 with a time of 4:50 while competing in the youth girls division at the July 29-Aug. 3 event. Both finishes earned All-America status for Huang, who will run cross-country for the Vikings this fall. It was the third year in a row that Huang finished in the top three in Region 14 and earned a spot in the Junior Olympics. At the 2002 competition in Omaha, Neb., she reached the finals in the 800 meters (12th place), the 1,500 meters (10th place) and earned All-America honors with an eighth-place finish in the 3,000 meters. Huang, an A student who plays flute in the band and won the school's scholar athlete award, recovered from shin splints this spring. She also played basketball and volleyball on the Miller Middle School teams. 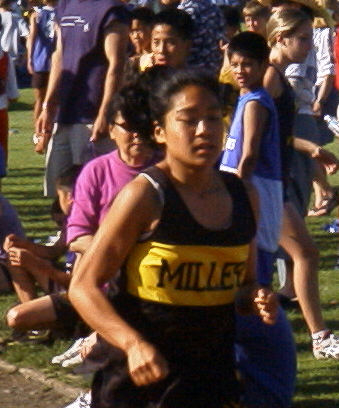 Her younger sister, 10-year-old Cindy Huang, a student at Muir Elementary School, also had a solid meet, finishing 22nd in the bantam girls 1,500 meter run.